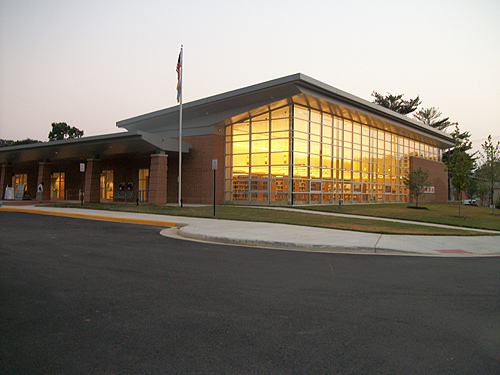 Fairfax County Public Library system has built a useful, award-winning Eco-friendly library in the Arlington Blvd. Thomas Jefferson neighborhood branch. It features red bricks on three sides and a wall of open glass on the Rt. 50 side – facing the main road and service street. I have three pictures snapped and collected @ Twitter – collocated under the hashtag: #jltaglichtjfcpl – of the external. Future potential for internal images. I simply want to quickly describe the building’s design features – attributes which are new in ideology and yet traditional in design thinking in library buildings. The first of these is the ease of access to the reference desk. It sits in the very middle of the floor where it acts simultaneously as point-of-service and Panopticon over the stacks and nearby computer terminals. The green-friendly wall of glass on the northern wall allows so much natural light in. I have written in the letting in of natural light to libraries before. This simple solution saves money on lighting (energy use itself is also theoretically reduced). But it also changes the texture of the light from fluorescent to something altogether different. Of course, it’s not as if light has not always played in a part in library design. Traditionally, light has been a part of libraries as representative of the light of knowledge and truth. But in this building’s case, much of the used and useful light comes from outside the library. I might suggest the “truth” here is that one form of truth (s) is dependent on other types of truth (s). This branch is not the biggest in the Fairfax County Public Library system, but it certainly is nearly the newest. It’s emphasis on open space, light and green-compatibility marks it as representative of current thinking in architecture and use-design. These features are not, however, the building’s only interesting elements. It also features rent-able rooms and shelves for free community-oriented reading outside of the view of the stacks and the reference desk. I find this quite interesting because even though many libraries have rooms for community events set aside in his square footage, this building seems to turn locate the community stuff connected via the entrance of the building (all connected through the foyer) and yet NOT the stacks themselves. There could surely be more written more on this topic of design and the peoples’ use. Hmmm, as a library user of some regularity, I heartily recommend getting or renewing your Fairfax County Library Card and becoming a regular patron of this branch if it’s convenient. If not, at least take a visit (maybe via bicycle since it has access by a service road and has racks for many bikes by the front door) and see what you think. As always, dialogue is welcome. This entry was posted in libraries, library design.